Attendees of the Ninth Annual Builder & Developer Luncheon in February were provided with an update on the Des Moines-area new construction housing market and breakdown of lot inventories by city. Follow the links to access to my Q1 2016 presentation slides and complete housing statistics for 2015. Given 2015 was a RECORD YEAR with 8,795 single-family homes sold – compared with 7,935 total homes sold during a very strong market in 2005 – a look back over the past 12 months shows many encouraging signs that 2016 could be another great year for local builders. 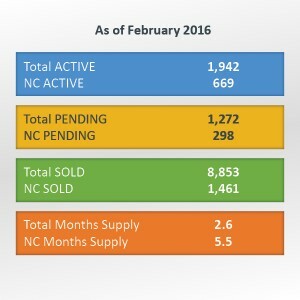 As of February 2016, the number of total active listings of single-family homes in the Des Moines market stood at 1,942, compared with 2,291 for the year-earlier period. In 2010, there were more than 3,300. The total months’ supply of single-family homes in February 2016 was 2.6 months, compared with 3.6 months last year. For new construction, the supply fell to 5.5 months, compared with 6.3 months in February 2015. Given a six months’ supply equates to a good balance between buyers and sellers, we can see that the Des Moines area has swung to a strong sellers’ market. In 2015, 1,456 new construction homes were sold, approaching the level we were at with 1,693 new homes sold in 2005. As current inventories remain low, the average new construction sales price has continued to rise significantly during past couple of years. 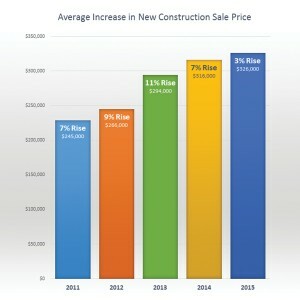 This chart details five years of average new construction prices and the percentage of inflation. A three percent rise, to $326,000 in 2015, indicated a more stable increase in and is a relief to the building industry, which has had to endure high price hikes year after year on building materials, labor and then a spike in land costs. The lot shortage, generally speaking, is behind us. More than 1,000 lots were developed, in the past two years, than building permits pulled. Today, that means builders have more options then they did in the recent past. A great MOTIVATOR for Des Moines-area builders is that housing inventories remain low, and the market is not overbuilt with new construction homes. 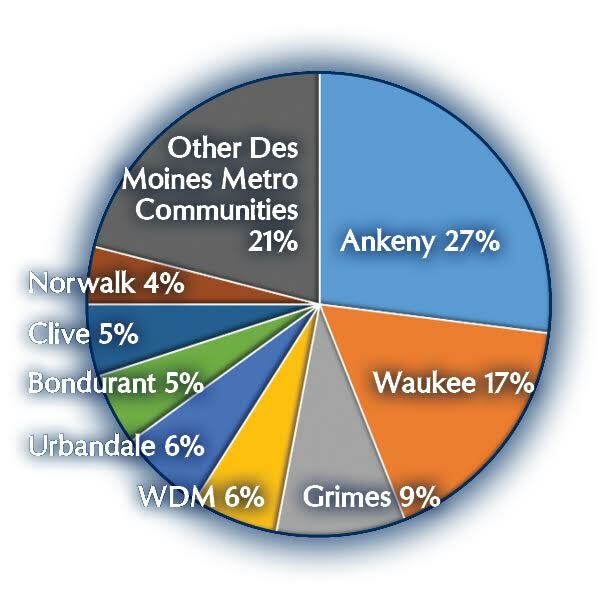 The top eight new construction communities below made up 79 percent of new construction sales activity, with Ankeny, Waukee and Grimes leading the way in 2015. If we were to see a slow down of some sort with the housing market – due to factors such as an interest rate hike, the impact of the slowdown in the agriculture economy, or some unknown black-swan event – DEVELOPERS could be caught with some super expensive lots and high-priced land. Moreover, it is possible that builders could be holding homes priced above what the average homeowner in their community can afford. In conclusion: Proceeding with caution and assuming no unforeseen changes to the market, we anticipate 2016 to be another good year. This entry was posted in Housing Statistics, New Construction and tagged Des Moines, housing statistics, Iowa, new construction. Bookmark the permalink. Follow any comments here with the RSS feed for this post. Trackbacks are closed, but you can post a comment.